I spent today in the AEC’s counting centre in Sydney where the AEC was conducting a new two-candidate preferred count between the ALP and Greens, due to the Greens outpolling the Liberal Party on primary votes. On the first day, the AEC completed the count in twelve of those polling booths, with another forty yet to be counted. New counts are also being held in the Melbourne seat of Batman, where the Greens also overtook the Liberal Party, and in Denison, where independent candidate Andrew Wilkie is expected to overtake the Liberal Party on Greens preferences. In the seat of Grayndler, the Greens have won three of the twelve booths counted so far, with Labor ahead in the other nine. It’s worth noting, however, that most of these booths are in the western part of the seat, which is generally weaker for the Greens. While the AEC currently has the ALP on 55.2% of the two-candidate preferred vote, my analysis shows that the current preference flows from the Liberals and smaller parties would produce a result of around 54.5%, and this is likely to fall further as more booths in the eastern part of the seat are registered. Overall, this means that Grayndler will now be a marginal seat, with a smaller margin than Lindsay Tanner had in Melbourne after the 2007 election. 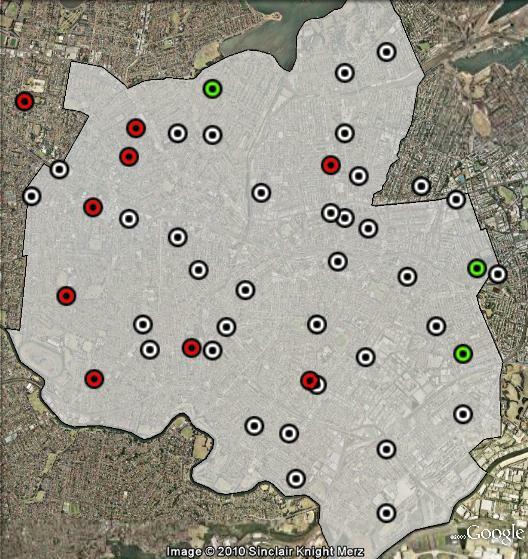 Out of the three booths that the Greens have won: two are very close to the Newtown area, with very high Greens votes. The third, Dobroyd Point, is a strongly Liberal-voting area at the northern edge of Ashfield council, close to Sydney Harbour. In that booth, the Liberals came first on primary votes, and a large majority of those votes flowed to the Greens after the Liberal was eliminated. Polling booths in Grayndler. Red booths won by ALP, green booths won by the Greens, white booths yet to be counted. The more interesting race is in Denison, where polling booths flowed in this afternoon, alternatively producing predictions of a Wilkie victory or a win for the ALP’s Jonathan Jackson. When counting finished for the day, votes had been counted in 28 of 56 polling places. Those booths seemed to have been selected according to alphabetical order. At the moment, the ALP’s Jackson is ahead in the count, with 50.64% of the two-candidate-preferred vote. Yet it appears to me that the remaining booths are concentrated in areas where Wilkie has performed more strongly. I divided the booths in Denison into six areas, the same six areas I used to analyse the previous election’s results in my seat profile. In the northern City of Glenorchy, the ALP has polled over 62% of the two-candidate-preferred vote. Wilkie is winning the vote in City of Hobart area and those booths at the southern edge of the seat. In the northern areas, we are waiting on results from booths which cover about 9000 votes, while in the south we are waiting on booths covering about 14000 voters. This suggests that Wilkie has more votes to gain in his strong areas than Jackson does in his. Indeed, Wilkie has won every single booth in the City of Hobart and the southern edge of the seat, and Jackson has won every booth in Glenorchy. Yet 57% of the population of Denison lives in the areas won by Wilkie, and there are more of those votes yet to be counted. In addition, there are over 6000 votes yet to be counted in both Hobart (where Wilkie is currently at 58%) and Sandy Bay (where he is at 64%). Bearing all of this in mind, you would expect that Wilkie will come out on top from the ordinary votes yet to be counted, although it is yet to be seen whether this will be decisive enough to give him victory, or Wilkie would still require a strong performance on postal and absentee votes. Polling booths in Denison. Red booths won by ALP, yellow booths won by Andrew Wilkie, white booths yet to be counted. Ben, you may be able to answer this. In the final full preference count are all the ballots dumped in together and then counted as one lot. It seems that in a case like Denison the booth by booth counting could hide the true order of candidate elimination. I think I can answer that Sam, if Ben is too busy scrutineering. The preference counts they are doing at the moment are just indicative ones – what they normally do on election night, but are redoing because they picked the wrong two candidates. They will then do the final full preference count, where they do put all the booths in together, once all the postal and absent votes have come in some time next week. You’re right that it’s not clear at this stage if it really will be a contest between Labor and Wilkie. Wilkie will presumably not do too well on the postals and absents, and once you consider the Socialist Alliance preferences, which will presumably flow strongly to the Greens, he may yet fall behind the Greens. Interesting to see that the Greens vote has held up right across Hobart City (still leading by a wide margin in many booths, despite a slight swing) while at the same time making some considerable gains in Glenorchy City. Without Wilkie in the mix this would have been an interesting challenge from the Greens. Whether Jackson or Wilkie are elected they will have to stand up to a strong fight from the Greens come the next election.